Masa (雅) is a Japanese and sushi restaurant located on the fourth floor of the Time Warner Center at 10 Columbus Circle (at West 60th Street and Broadway) in Manhattan in New York City. The restaurant was opened by Chef Masa Takayama in 2004 and is considered one of the most expensive restaurants in the world, as well as the most expensive restaurant in New York City. Located next door to the restaurant is Bar Masa, cheaper and offering an à la carte menu. In 2009, a second Bar Masa opened inside Aria in Las Vegas. The offerings are Omakase (no menu) only, with chef-selected meals costing US$595 per person, not including tax or drinks, though gratuity is included. The sushi bar itself is a US$260,000 piece of rare hinoki wood from Japan; Masa is one of only two sushi restaurants in North America to have a hinoki wood sushi bar. Reservations for the 26 available seats are taken three weeks in advance. Chef Masa Takayama prepares the menu himself, often including seasonal ingredients. He uses many exotic ingredients, such as truffles and Kobe beef. Most of the fish is flown in from Japan. Chef Masa can be seen working behind the bar and will sometimes serve the food as well. While there is no menu to order from, Chef Masa does keep a record of what he has served to his customers and what their reactions were so he can cater to them on their next visit. Masa garnered the Michelin Guide's highest rating starting with the 2009 guide and was the first Japanese restaurant in the U.S. to do so. It received three out of four stars by The New York Times. It has also received five out of five stars in the Forbes Travel Guide (formerly known as the Mobil Guide). It has been named as one of New York's Top 50 by Travel + Leisure. Forbes named Masa as the Most Expensive Restaurant In The U.S. for 2005 through 2009 as well as The World's Most Expensive Sushi in 2007 through 2009. Masa Takayama was born and raised in Japan. After high school, he worked at Tokyo's famous Sushiko in Ginza. 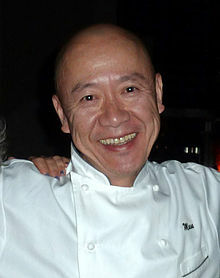 In 1980, he moved to Los Angeles, where he eventually opened his own Ginza Sushiko. He established Ginza Sushiko as one of the most expensive restaurants in Los Angeles at an average meal price of $105 per person. Nearly 20 years after opening the restaurant, he sold it to his sous-chef and moved to New York to open Masa, and later Bar Masa in both New York and Las Vegas. He opened a second restaurant in Las Vegas in 2009. ^ Michelin rolls out 2011 NYC restaurant guide Archived 2014-08-10 at the Wayback Machine, CNN, October 6, 2010, Accessed November 9, 2010. ^ a b "Masa". Masanyc.com. Retrieved September 21, 2010. ^ "Masa Menu – Upper West Side – New York Magazine Restaurant Guide". Nymag.com. Retrieved September 21, 2010. ^ Masa and Mas Win in New Food Guides, The New York Times, October 8, 2008, Accessed November 8, 2010. ^ Ryan Sutton, Masa's $1,000 Meals Earn 3 Michelin Stars; Ko Gets 2, Bloomberg.com, October 6, 2008, Accessed November 8, 2010. ^ Masa Review, The New York Times, June, 2011. ^ Masa, Forbes Travel Guide, Accessed November 9, 2010. This page was last edited on 28 February 2019, at 18:07 (UTC).